Mario hasn’t had the most stellar history when it comes to games being released on Nintendo’s mobile platforms. Super Mario Land was as drastic a departure from the Super Mario Bros. style as Super Mario Bros. 2 was. Super Mario Land 2: Six Golden Coins would correct that jag and is completely recognizable as the Mario we know and love. Then came a bunch of rereleases of the NES, SNES, and N64 Mario games before an all-new creation hit the DS when New Super Mario Bros. was released. Until last month, there had only been 3 original Super Mario games (I don’t count Super Mario Land 3, that’s a Wario game) released on the variety of handhelds. With Super Mario 3D Land, we have our favorite plumber in a different world. While that might sound great, it isn’t necessarily the case. The first thing you notice when you press start to begin your adventure is a sense of familiarity. 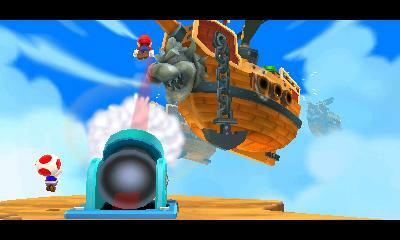 Super Mario 3D Land borrows heavily from Super Mario Bros. 3 and rightly so. From the Tanooki suit to the screen wipes to all manners of colored blocks and music in between, it’s a nostalgia trip in a fresh location. Along with the SMB 3 references, you can tell that Nintendo took a lot of notes from the Mario Galaxy series and incorporated them on the 3DS. The depth of the levels and their floating natures really harken back to the planetary land masses in Galaxy. It’s that depth that is super important because without it, the 3D wouldn’t have the same effect. Yes, there are airships. No Cannon Brothers though. What everyone wants to know about when it comes to the 3DS is not surprisingly, the 3D. When I first got my hands on an actual 3DS at a local Best Buy, my first impressions were less than stellar. Pilotwings was the game on display and I left after 5 minutes with a bit of a headache. However, I never once got that feeling with Super Mario 3D Land. I’m not sure if it’s because my eyes became accustomed to the parallax screen technology or whether the way that Mario is displayed just prevented the strain. Just know that it works, and works well. If you ever questioned the technology, play this game and you might be put at ease. All of the normal trappings of Mario games are here. However, the levels aren’t just populated by Goombas, coin blocks, and pipes. There are 3 special coins placed throughout each level. The coins aren’t as hard to find as the ones in New Super Mario Bros., but some levels will leave you scratching your head as you try to figure out where the hell that middle coin is located. Collect enough of these coins and you will unlock the special mode. Each world has its counterpart and the difficulty takes a serious ramp up. I ended the normal game with close to 100 lives and lost a considerable amount in the special worlds. Some levels were so frustrating that I had to put the 3DS down and come back to it later. Coming back to the game didn’t always lead to immediate success. There were times when Mario didn’t exactly do what my big hands told him to. I had a few issues with the controls throughout my time with the game. For the most part Mario handles like he’s supposed to. Yet, with the introduction of depth to each level, it isn’t always clear where Mario is going to land. Luckily he has a shadow that makes it easier to judge the landings but it still can be frustrating when jumping away from the screen. This is where the Tanooki suit comes in. The suit prevents errors in judgment because of the ability to float down from jumps. Though the suit can be seen as a crutch, I always wanted to have one. Without it, the levels bring a sense of danger not felt when you can float through the air. However, danger really isn’t an issue in Super Mario 3D Land. Even the most novice of Mario players should have no trouble blazing through the first 8 worlds. The first few worlds are ridiculously easy, though the difficulty does ramp up as you progress. After dying a few times on one level the game provides you a cheat, a golden Tanooki leaf that makes you invincible. Like the assist feature found in New Super Mario Bros. Wii, it helps you get past a difficult level. I refuse to use this option as I’m a glutton for punishment, but for those gamers who find one particular level too frustrating, it’s a good option for them to move on. You can always come back to it later to prove your gamerhood. This is where the 3D really shines. If you can get past the lack of difficulty, Super Mario 3D Land is a pretty great game. From the unique level designs, to the surprising additions that didn’t show up until the special worlds, I had a great time with this game. It looks absolutely gorgeous. The colorful visuals we have come to recognize in each Mario title are definitely showcased here. The game looks great in both 2D and 3D but is an absolute must play with the 3D slider all the way up. I always questioned the viability of 3D in video games. I understand it a little bit better now. Super Mario 3D Land is arguably the first must have 3DS title. Is it a system seller? Maybe not for everybody but for me it did the job. If future 3DS games can live up to the high standard set by the world’s favorite plumber then the system will be far more successful than anyone predicted at launch. But as it stands right now, Mario is the one title you must have in your collection if you are a 3DS owner. It’s not perfect and probably is too easy, but that doesn’t hold it back from still being a great game.